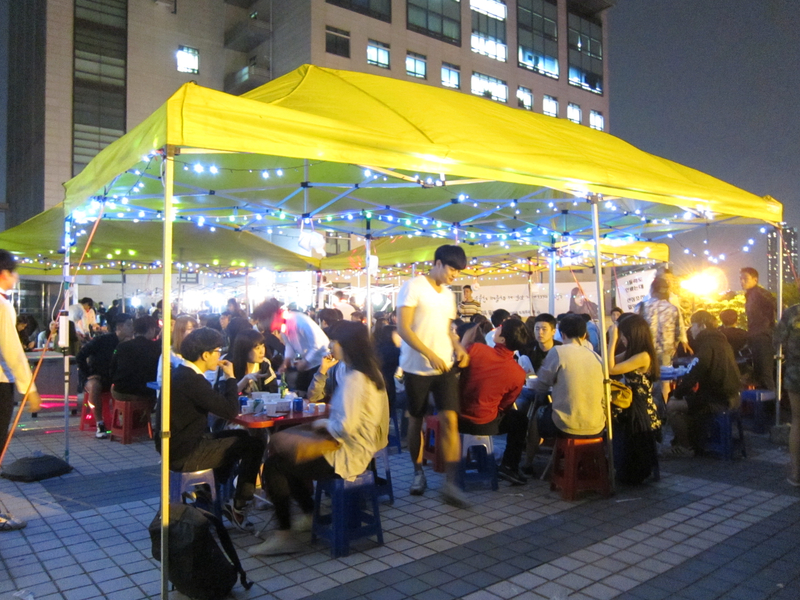 Every Spring semester, usually in the month of May, Korean universities hold a festival filled with food, performances and of course, drinking. University campuses transform into a bustling festival ground. Held during the period after midterms and before finals, university festivals are a perfect opportunity to unleash any stress you have. Almost all Korean students spend the majority of their high school lives studying in preparation for the college admission exams. Once all that studying has paid off and they’ve entered university, these festivals are a perfect opportunity for them to let loose and enjoy their university life. Lots of school clubs will also take this time to promote themselves and raise extra money. Clubs will set up little booths where you can do various activities. For example, the archery club let people channel their inner Katniss Everdeen and have a go at archery for a small price. 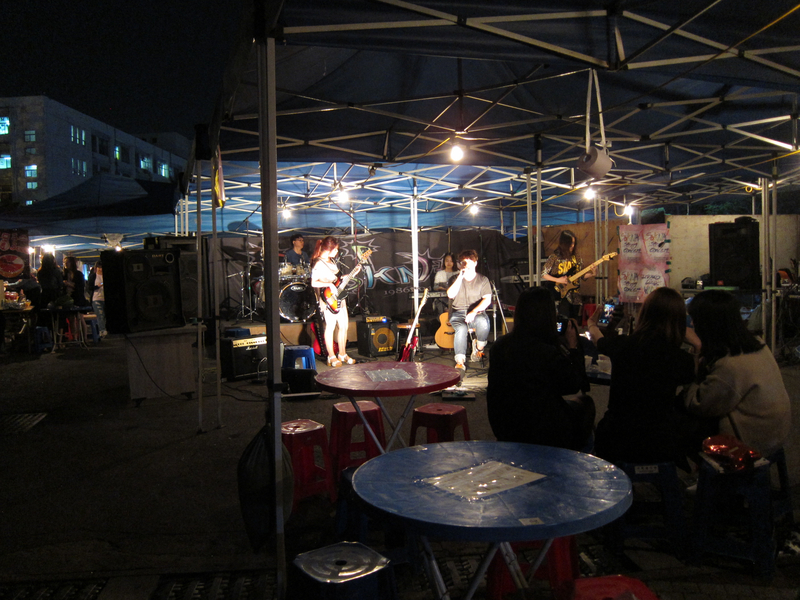 More commonly, student clubs will run “jujeoms” (주점), little tents that are sort of like a bar of pub. They sell alcohol and some small dishes to make some extra funds for their clubs. The campus grounds are linked with these drinking tents. That being said, the arrival of school festivals also means non-stop drinking! Koreans definitely work hard and play hard! Campus comes alive at night, and the festivities carry on late into the night. If you’re not so keen on drinking soju late into the night, don’t worry! There are a plethora of other activities to keep you entertained! There was even a job fair for international students to attend. My favorite parts of the festival were all the music performances. There were students busking all over campus every night, from simple acoustic performances on the side of the street to bands rocking out on stage. There were also lots of performances done at the amphitheater, from cheering performances to talent competitions all organized and performed by Hanyang students! And of course, the highlight of most university festivals- celebrity performances. This year Hanyang University’s special performances were singer Kim Yeon Woo (김연우), music duo Norazo (노라조) and idol group Girls’ Day (걸스데이). 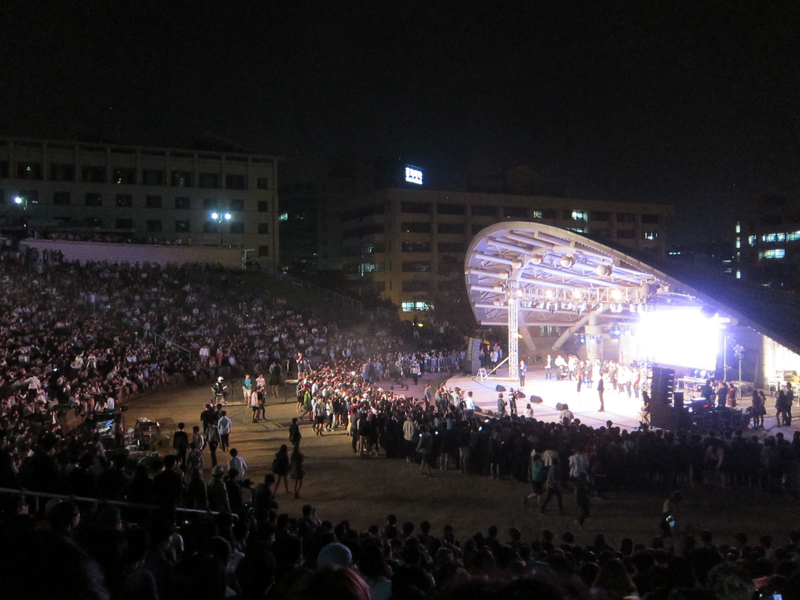 The amphitheater was packed with cheering university students, especially the last night of the festival when Girls’ Day arrived. Let’s just say I found the fan boys just as entertaining as the idol performance! The school festival was definitely an unforgettable event! I have never experienced anything like this back in my home university. The school spirit is extremely high during these three days, and there is so much free entertainment!